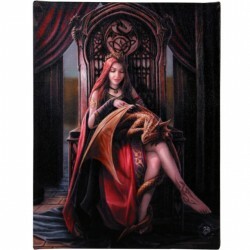 A stunning Anne Stokes canvas print stretched over a wooden frame. Sitting on an imposing oaken throne, Viking-style Dragon designs ornately carved into the back and sides, this young woman wears a draconic crown, pointed ears emerging from beneath her long red hair betraying her elven heritage. She looks down lovingly at the orange Dragon sleeping contentedly on her lap, its long tail coiled protectively around one of her legs.